Click here to join the Oklahoma Today book club on Goodreads. Dypaloh. There was a house made of dawn. It was made of pollen and of rain, and the land was very old and everlasting. There were many colors on the hills, and the plain was bright with different-colored clays and sands. Red and blue and spotted horses grazed in the plain, and there was a dark wilderness on the mountains beyond. The land was still and strong. It was beautiful all around. . . . In many ways, Lawton native N. Scott Momaday’s first book is the perfect introduction to the Oklahoma Today Book Club. From the first paragraph of the prologue, above, the Pulitzer prize-winning House Made of Dawn is packed with details that stir each of the five senses. Actually, packed is a particularly apt word here, as the book is a scanty 212 pages. While that page count makes House Made of Dawn a quick read, there is plenty for a group of readers to digest and discuss. Oh Milly the water birds were beautiful I wish you could have seen them I wanted my brother to see them they were flying high and far away in the night sky and there was a full white moon and a ring around the moon and the clouds were long and bright and moving fast and my brother way alive and the water birds were so far away in the south and I wanted him to see them they were beautiful and please I said please did you see them how they pointed with their heads to the moon and flew through the ring of the moon. . . . While the plot generally follows a chronological progression, the characters in House Made of Dawn—particularly the protagonist Abel—often live simultaneously in the past, present, and future. Momaday toys with many other literary conventions by shifting perspectives, interweaving different types of storytelling, and blurring the lines between dreams, reality, and places in between. Such haziness is perfect for the interpretation of a group of avid readers. The moment passed, and the next and the next, and he was running still, and still he could see the dark shape of the man running away in the swirling mist, like a motionless shadow. And he held on the shadow and ran beyond his pain. . . . Within the relatively few pages of House Made of Dawn, Momaday interweaves a rich tapestry of cultures, experiences, and emotions. Navajo poetry, tales of eagle hunting, and the trials of returning to civilian life after fighting in a war may seem unconnected, but before the reader is aware, she has been swept away on a journey that moves the soul. In order to make 2017 a better year, let’s get those souls moving in the right direction from the start. Click here and join the Oklahoma Today Book Club on Goodreads to get started. 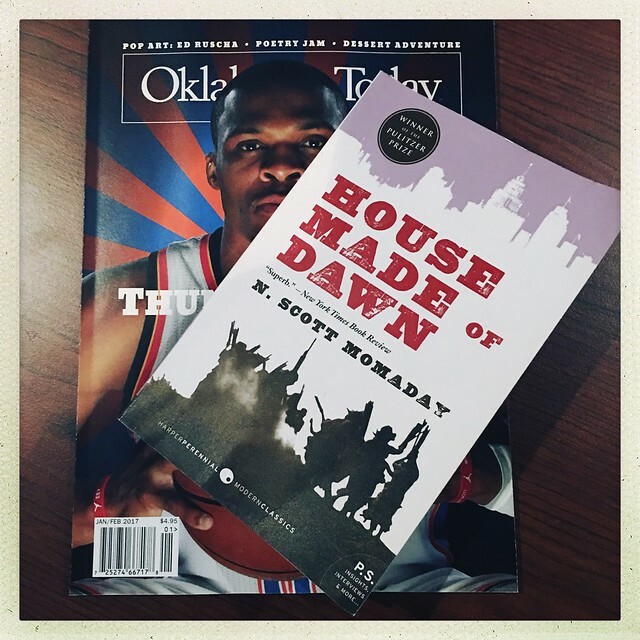 For a chance to win a copy of House Made of Dawn, email Karlie.Tipton@travelok.com and tell me which Oklahoma book you’re most excited to read this year.